Got RowPro 4 or earlier? Discover the new world that RowPro 5 opens up, and take your rowing to a new level. 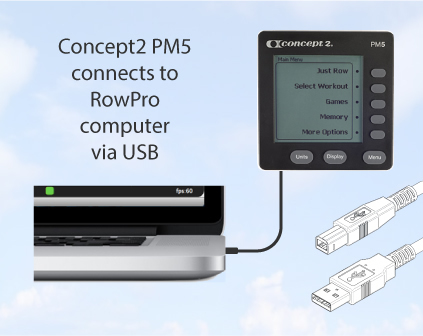 Digital Rowing proudly presents the latest upgrade to our flagship rowing software - RowPro 5. It's packed with major new features that will lift your rowing experience to a whole new level, including improved 3D graphics and a completely new user interface optimised for both click and touch. Now both Mac and Windows users can enjoy RowPro at its best. RowPro 5 is the next generation of RowPro, the product of over 15 years of expert development, and intensively tested by the most demanding users - our customers. RowPro 5 has all the features you've come to expect from RowPro, plus some major new ones: online logbooks, online training plans, the new online Oarbits, and a whole new user interface. RowPro 4 had the Microsoft .Net framework so deeply embedded that we had to completely rebuild most of RowPro to enable it to run on both Windows and Mac. That's been a quantum leap for RowPro that our Mac customers have warmly embraced since the first Preview. We've taken the opportunity to build a completely new user interface optimised for both click and touch. That's made RowPro simpler, easier, faster and more intuitive to use, particularly on the new breed of touch-screen laptops and tablets. We've kept the basic operation familiar, but you'll notice the many improvements right away. With software constantly changing and upgrading, permanent licenses are giving way to monthly and annual plans. Many users have asked for these, so with RowPro 5 we're offering a selection of monthly, annual and permanent plans. We've made sure to keep the permanent plans available, so now you get to choose how you want to play. When it comes to new features, RowPro 5 is one of the biggest releases we've ever done. For starters, it now runs in Mac OSX. To achieve that, we've created a completely new user interface optimised for both click and touch. That's made RowPro simpler, faster and more intuitive to use. And it doesn't stop there - check out these new features. Gone are the days of using Boot camp or Parallels to run RowPro in your Mac. Also gone are the Preview and Preview 2 of RowPro for Mac. With RowPro 5 for Mac now fully released, any Mac running OSX Yosemite 10.10 or later can run RowPro 5. For the record, we recommend you always run RowPro in the latest version of OSX or Windows. We've kept the basic operation familiar, but you'll notice the many improvements right away. Every panel has been redesigned and rebuilt from scratch. Session Setup has been renamed Set up a Row, and the Control Center has been replaced with a local and online logbook, tools and preferences, and a new web-based Oarbits. We've also created a RowPro online logbook, and enabled RowPro to automatically upload your results there as soon as you're done rowing. There's also a local logbook if your RowPro computer is offline. Your RowPro online logbook can export to your Concept2 logbook automatically. You'll notice the woman rower's appearance and posture are significantly improved in RowPro 5. But much more noticeable is the smoother, more beautiful 3D graphics provided by the anti-aliasing with Windows 10 and Mac OSX. The improvement has to be seen to be believed. We've moved three key RowPro functions online, then integrated them back into RowPro so smoothly it feels like they're still embedded. We've shifted activation from using a license to using a product key for simpler, more intuitive activation. And we're replacing the Oarbits App with a new RowPro App that you'll even be able to row with! Some of our customers want to shift to monthly or annual plans, others want to stick with permanent plans, so with RowPro 5 you get to choose. The cost ends up being about the same over a few years, but with the monthly and annual plans all version upgrades are free and all premium features and the RowPro App are included free. We've moved your RowPro logbook, the training plan wizard and Oarbits online, then integrated them back into RowPro. The result is that those functions can be used both with RowPro and the upcoming RowPro app, plus you can reach them from anywhere via a web browser. The Oarbits App was built on technology that we've now replaced with the latest and best. The upcoming RowPro App for iOS and Android will do everything the Oarbits App did, plus you'll be able to access your RowPro online logbook and your RowPro training plans from within the app. But the best part is that you'll be able row with it. Some of the more advanced functions are still being completed. These include advanced custom rows, advanced pace boats, multi-language and multi-erg. We plan to complete these in the months following release of RowPro 5 for Windows. If you notice something missing, just stand by and in time it should arrive. When we ask people what they love most about RowPro, the number 1 answer is motivation. RowPro 5 is designed to lift your motivation to row, whether it's the smoother, more beautiful 3D graphics, the new online logbook for tracking your progress, or the simpler and more intuitive user experience. RowPro 5 has major new functions, smoother and more beautiful 3D graphics, simpler and more intuitive user interface, support for all the latest technologies, and a long list of other improvements. It builds on over a decade of RowPro development to help your rowing step up to a new level, so you'll get the results you want from your rowing. For a limited time, we're offering upgrades from earlier versions of RowPro for the special low price of $49. We're also offering a range of payment options including monthly, annual, 2-year, 3-year and permanent plans. Check out the Pricing and options tab for details. Microsoft is progressively moving on to newer technologies, and in the process ending support for some of the older ones that earlier versions of RowPro depended on. Over time, as Windows Update quietly introduces upgrades, more people will have more issues running earlier versions of RowPro. The practical solution in these cases is to move to RowPro 5. For a limited time, we're offering upgrades from earlier versions of RowPro for the special low price of $49. We're also offering a range of payment options including monthly, annual, 2-year, 3-year and permanent plans in response to customer demand. Check out your upgrade options below. You can upgrade your RowPro 4 or earlier permanent license to a RowPro 5 permanent plan for just $49. To do this, click the Check your upgrade options button below, and in the Upgrades tab enter your RowPro 4 or earlier license number. Note that RowPro 5 activates with a product key - you'll get this when you upgrade your RowPro 4 or earlier license. You can upgrade your RowPro 4 or earlier permanent license to a RowPro 5 monthly, annual, 2-year or 3-year plan for just $48. To do this, click the Check your upgrade options button below, and in the Upgrades tab enter your RowPro 4 or earlier license number. Note that RowPro 5 activates with a product key - you'll get this when you upgrade your RowPro 4 or earlier license. Prices for permanent and annual plans work out about the same over several years. But with monthly, annual, 2-year and 3-year plans, major upgrades are included, and so are all upcoming premium features and the RowPro app. When you upgrade to any RowPro 5 plan, you can use each RowPro 5 product key to activate RowPro 5 in either Windows or Mac. This means there's no penalty now or in future if you want to shift from Windows to Mac or back the other way. And with your new RowPro 5 online logbook, moving to a new computer in future will be a breeze. One of the major changes in RowPro 5 is that it activates with a product key, not a license. You'll get the product key automatically when you upgrade your RowPro 4 or earlier license to RowPro 5. Whether you're upgrading to RowPro 5 for Windows, or cross-grading to RowPro 5 for Mac, just follow the steps below. RowPro 5 is designed from the ground up to install and run in both Windows and OSX. This means it's a considerably different product vs RowPro 4. It doesn’t replace / upgrade RowPro 4, it installs ‘alongside’ RowPro 4 in your PC. This means you can install, run and uninstall RowPro 5 without it having any impact on RowPro 4, and vice-versa. Download the RowPro 5 software package from www.digitalrowing.com/software and activate it as a free trial to make sure it's all go. Locate your RowPro 4 license number in Help | About RowPro. Click the Check your upgrade options button below, and in the Upgrades tab enter your RowPro license number to upgrade to a RowPro 5 product key. Start RowPro, click the blue link I have a Product Key and enter your new product key to activate RowPro. Use the www.digitalrowing.com/rowing/myrowpro.html utility to upload your rows from your RowPro 4 or earlier database into your new RowPro online logbook. If you need assistance with any upgrade issues, please contact assist@digitalrowing.com. Once you have installed and activated RowPro 5, and used the www.digitalrowing.com/rowing/myrowpro.html utility to upload your rows from your RowPro 4 or earlier database into your new RowPro online logbook, you can uninstall the older version of RowPro.